Alexandrina - Magnolia soulangeana - Upright multi-stemmed tree with tulip shaped purple-pink blooms with a white interior. Its late bloom time makes it perfect for colder climates. Hardy to -30F (-34.4C); height: 15ft. Ann - Magnolia x - Erect compact growing magnolia blooming in mid April. Flowers are large and red-purple on both sides. Hardy to -20F (-28.8C); height: 10ft. Betty - Magnolia x - Bred by the US National Arboretum, this variety has large 8inch blooms with white centers that emerge later than most leaf-losing varieties. Hardy to -20F (-28.8C); height: 10ft. Chinese Magnolia - Magnolia soulangeana - Large bush or small tree bearing a profusion of large white blooms, blushed with purple. Hardy to -20F (-28.8C); height: 15ft. Jane - Magnolia x - Strong vigorous upright shrub or small tree with extremely large fragrant blooms. Color is re-purple on the outside and white on the interior of the bloom. Blooms early May. Hardy to -20F (-28.8C); height: 10ft. Lily Magnolia (Woody Orchid) - Magnolia liliflora - Large shrub or small multi-stemmed tree with large dark green leaves and 4in. deep red-purple blooms. Hardy to -30F (-34.4C); height: 15ft. Little Leafed Cucumber Tree (Little Leaf Magnolia) - Magnolia accuminata - One of the largest varieties of magnolia with large oblong leaves and greenish-yellow flowers followed by coral seed clusters. Hardy to -30F (-34.4C); height: 90-100ft. Leonard Messel - Magnolia x loebneri - Slow growing mutli-stemmed tree with deep pink buds that open to reveal lighter pink blooms. Hardy to -20F (-28.8C); height: 10ft. Northern Japanese Magnolia (Kobushi Magnolia) Magnolia kobus - This variety is well adapted to cooler climates and loses its leaves in the winter. 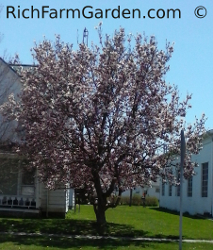 A medium sized tree or large shrub with multiple trunks and 3-5inch white star shaped blooms before the leaves open. Uncommon in the US. Hardy to -20F (-28.8C); height: 30ft. Oyama Magnolia - Magnolia seiboldii - A leaf losing variety with large 3-4inch white flowers with crimson stamens that blooms when quite small. Hardy to -10F (-23.3C); height: 15ft. Royal Star Magnolia - Magnolia stellata 'Royal Star' - A cold hardier hybridized version of the Star Magnolia with large white flowers. Hardy to -30F (-34.4C); height: 12ft. 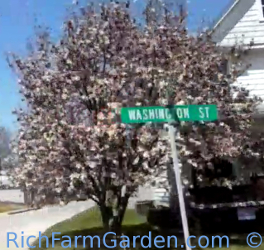 Star Magnolia (Stellata Magnolia) - Magnolia stellata - A smaller leaf losing variety with white to pink 3-4inch flowers. Hardy to -20F (-28.8C); height: 15ft. Southern Magnolia - Magnolia denudata - This is the magnificent evergreen magnolia familiar to everyone in the southern US. Large leathery leaves and creamy white blooms - very fragrant. The tree itself may reach a height of 90ft. and will flower profusely. Hardy to -10F (-23.3C); height: 90ft. 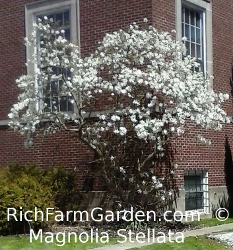 Sweet Bay Magnolia - Magnolia virginiana - Blooms later than most other varieties and may remain evergreen in warmer climates. Fragrant white flowers are borne in the summer. Hardy to -20F (-28.8C); height: 15-60ft. Yulan Magnolia (Temple Magnolia, Lily Tree) - Magnolia denudata (Magnolia conspicua) - This Chinese leaf losing native commonly planted around temples is a large specimen with huge 8 inch white flowers that open before the leaves open. Magnificent! Hardy to -10F (-23.3C); height: 50ft.